Grand Chase Mobile is now officially out worldwide and challenges you to build the best heroes team for a variety of game modes; PvE, PvP, boss, Daily Defense, Wizard’s Labyrinth, and more. Not all the heroes are great. You can fuse unwanted heroes to get a better rank hero using the fusion feature. Additionally, you will need tons of monster cards to upgrade the heroes. And once you reach the maximum level, you will need to evolve the heroes using the evostones. And, at last, if you have loads of monster cards in the inventory or many unwanted heroes, you can sell them for Prana and Prestige mark. 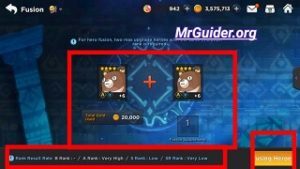 Let’s learn in details: Grand Chase Mobile fusion, monster cards, how to get evostones, sell cards. In the fusion process, the player sacrifices two heroes to get a new one. Both the heroes should be at the maximum upgrade level. For example; A five-star hero’s maximum upgrade level is 9. A 4-star hero’s maximum upgrade level is 6. You can increase the level cap by evolving the heroes. The second requirement in Grand Chase Mobile fusion process is both the heroes should be on the same Evo rank; 3-star+3-star. You can not fuse a 3-star hero with 4-star hero. How to fuse -> Tap the bag icon at the top-right corner -> tap the fuse button. After selecting the heroes, you can check the fusion result rate at the bottom-left corner. For example – You could get an SR rank hero upon fusing two S Rank heroes if the SR rank rate is very high. To awaken the SR unit, the player needs a Radiant Shiny unit(not splendid shiny). The radiant shiny unit can be obtained by transfusing a fully awakened 6-pinked star S rank unit. How to get a 6-Pinked star unit? Use the awakening feature. To awaken, that unit must be of 6-star and at its maximum upgrade level(+12). In this awakening process, you need a splendid shiny unit or same unit(+12, 6-star). To upgrade the heroes in Grand Chase Mobile, the player needs monsters. You can obtain monster cards from the adventure mode, from the chests, summon shop, using monster card item(can be purchased from the coin shop). To open the chests, you need keys. You can obtain these keys from the item shop, honor shop, mission reward/bonus. You can sell heroes, monsters to obtain Prana coins, Prestige mark. Go to the inventory menu by tapping the bag icon at the top-right corner. Switch to the hero/monster tab and tap the sell hero button near the fusion button. On the next screen, select the monsters or heroes you want to sell for prestige marks, prana coins. How To Expand Inventory Slots? If your inventory is full, then you would not be able to play the adventure mode. The game provides 64 slots for heroes, 64 slots of monsters, 32 slots for equipment, accessory. Go to the inventory menu -> tap the + icon next to the number of slots at the bottom-left corner. You can use gold to expand the inventory. How To Get Evostone In Grand Chase Mobile? Gold Farming -> Completing the daily missions, weekly missions is one of the best ways to farm gold in Grand Chase Mobile.